A project which takes as its point of departure the Swedish welfare state’s vision of the “good society” and how “goodness” is represented in politics, art and popular culture in today’s post-utopian society. These utopian efforts have, since Gulag and the fall of the Berlin wall, been compromised and the vision of the “good society” has been replaced by realpolitik and an adjustment to the globalised economy. The concept of goodness as a positive force in society has, furthermore, been taken over by the conservative right in terms of “family values” and “civil society”. In the fields of art and philosophy the concept of “goodness” did not arouse much interest during the twentieth century. “Goodness” has a tendency to be considered as slightly banal and uninteresting, and when goodness is portrayed in the arts, it is often connected with innocence and lack of intelligence. Evil people, on the other hand, are described as fascinating and complex personalities. The project The Ont takes as its point of departure the Swedish welfare state’s vision of the “good society” and seeks to re-evaluate this in the light of how “goodness” is represented in politics, art and popular culture in today’s post-utopian society. 1. E.g. Bataille’s Literature and Evil, Ricoeur’s Symbolism of Evil, Baudrillard’s The Transparency of Evil, American Psycho, Natural Born Killers and Blue Velvet. 2. This association of goodness with innocence goes back to the story about the Garden of Eden in Genesis where Adam and Eve commit the original sin by eating the forbidden fruit from the tree of the knowledge of good and evil. 1993. Ø 63 x 100 cm. Coffee, porcelain, wood, plastic and electric pump. Installation at "Transpositions" at South African National Museum, Cape Town, 1998. Collections of Peter Norton and Eileen Harris-Norton, Santa Monica. 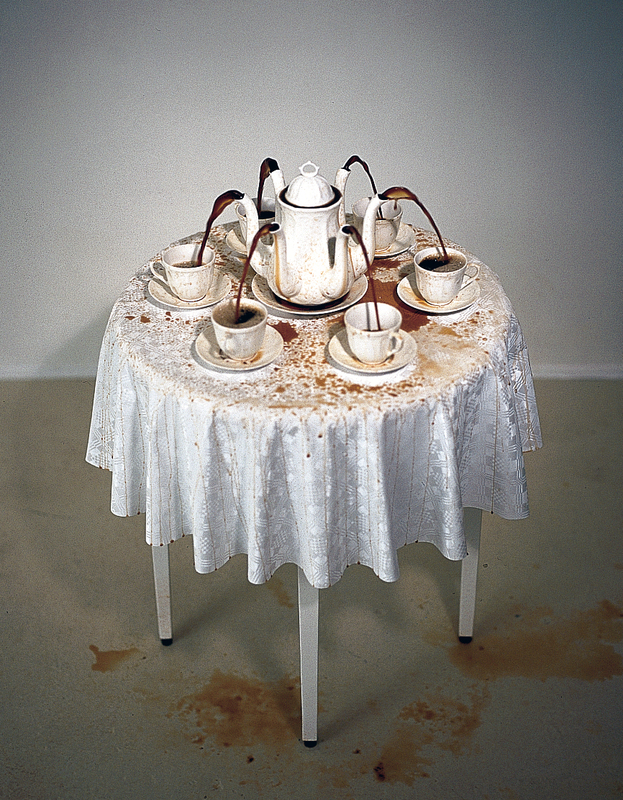 A modified version of the classic Swedish coffee service Blå Blom the with six spouts on the coffee pot instead of one. The work was custom made at the same porcelain factory in Gustavsberg where the coffee service Blå Blom has been produced since 1875. The coffee runs through the pot, down into the cups and into a bowl where an electronic pump forces the coffee up through the pot again in an endless cycle. The amount of coffee that runs through the installation in one hour represents the average amount of coffee that a Swede drinks per year (Sweden has the second largest coffee consumption per capita). The six coffee cups are, however, not filled with the same amount of coffee despite the fact that each of the six spouts of the coffee pot distributes the same amount of coffee to the coffee cups. The work was first produced for the exhibition Combi-Naçion at Museo Mural Diego Rivera, Mexico City, 1993. More works from The Good Person Project will soon be published.